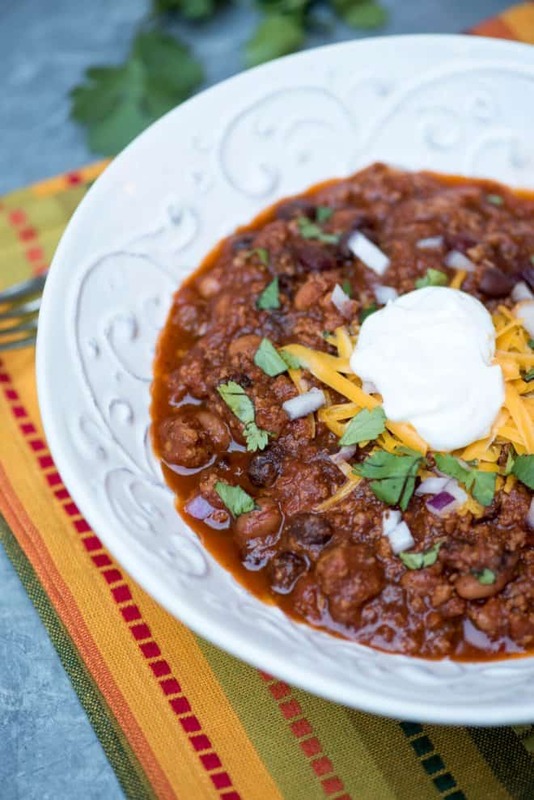 This lean Three Bean Turkey Chili will satisfy even the heartiest of appetites. It’s packed with lean ground turkey, three kinds of beans, and a variety of Mexican spices. Serve it with the toppings of your choice for a delicious, comforting meal. This post was updated with new images and a video on June 5, 2017 but the recipe is and will forever remain the same! This recipe brought a film crew from Seattle to my house about this time last year. It’s that good. Really, I kid you not. They dropped by to film a webisode of What’s Cooking for Allrecipes.tv featuring little ole’ me cooking away in my kitchen. Goodbye comfort zone! Three of my four boys got in on the action too. 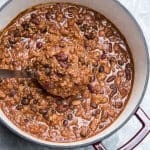 I’ve been a dedicated user of Allrecipes.com since I stumbled across it back in 2004. Since that time I’ve prepared and reviewed hundreds of recipes, had many of my own published on the site and have become involved on a much deeper level than I ever imagined. The What’s Cooking shoot came at a particularly busy and chaotic time. I was in the process of planning our end of the season water polo banquet, Thanksgiving was days away, and we were just a couple of weeks away from a major re-haul of our kitchen. The video will serve as a record of our old, original white tile counter which is now history. Although I consider myself a behind the camera kind of gal, it was a blast and a nice distraction from the chaos. Michael Ketchum (above) and David Albright from Allrecipes really know their stuff and the resulting video is so much fun. Thanks guys. Come back to San Jose any time. 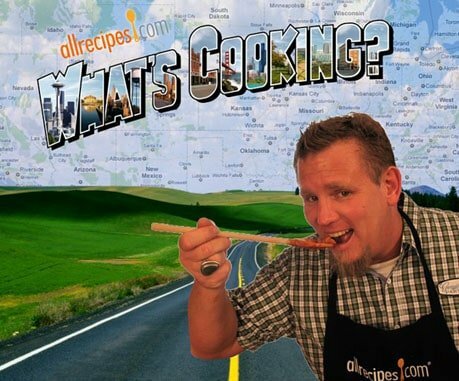 You can watch the What’s Cooking segment here but come back so we can make chili! This recipe is the result of over twenty years of tweaking and modifying. It is quite a departure from where it started. 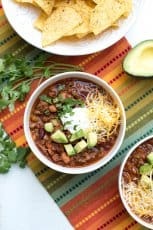 As my boys grew and became fans of Mexican food, I started changing it up, adding in a variety of beans and Mexican spices. 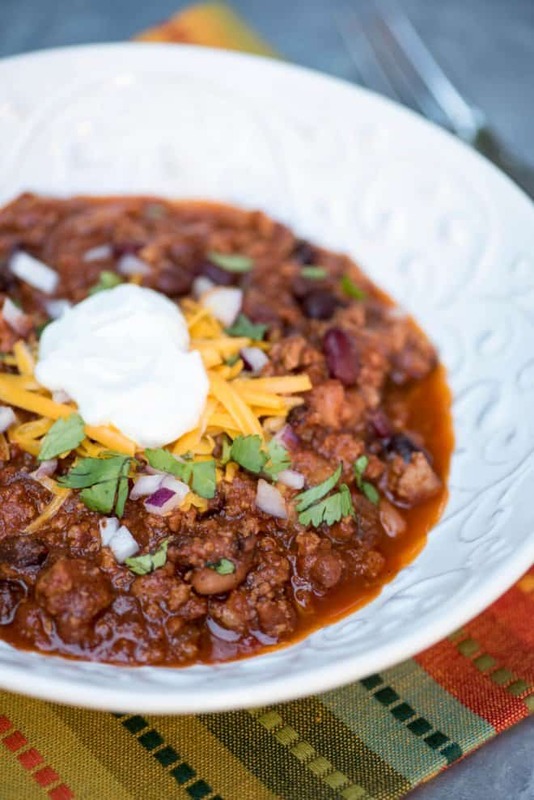 I like to serve the chili with lots of toppings for everyone to choose from – cheese, sour cream, cilantro, chopped bell pepper, chopped tomato, the possibilities are endless. It’s one of those meals we can all feel good about. Hearty enough for my athlete sons but light and healthy for the rest of us. I cant’ tell you how many times I’ve made this recipe. It has been on regular rotation on our menu since my boys were very young and we love it just as much today. I made my own little video to show you how it’s done. I want to include a note about how to best achieve the appropriate spice level. When cooking for kids or others who might be sensitive to spicy foods, I’ve found I can most consistently achieve the level of heat I’m going for when I use crushed red pepper versus jalapenos. Lots of folks like to include diced jalapenos in their chili but I have found that they can vary quite drastically in the amount of heat they put out. The 1/2 teaspoon of crushed red pepper flakes I add to this recipe results in what I would consider to be a mildly spicy chili. Adjust the amount up or down to suit your taste or absolutely add some diced jalepenos if you love them. 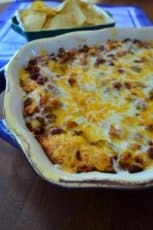 For more delicious ways to use ground turkey, check out these Turkey Meatballs, my Turkey Black Bean Enchilada Bake, and one of the most popular recipes of all time on Valerie’s Kitchen, my Italian Stuffed Zucchini Boats. Cook and stir the ground turkey in a large pot over MEDIUM heat until crumbly and no longer pink, about 5 minutes. Stir in the crushed tomatoes, tomato sauce, kidney beans, pinto beans, black beans, onion, garlic, and red wine. Season with chili powder, cumin, parsley, oregano, black pepper, red pepper flakes, and bay leaves. Bring to a simmer over MEDIUM-HIGH heat, then reduce heat to LOW, cover, and simmer 2 hours. Stir the chili occasionally as it simmers. Remove and discard bay leaves before serving. 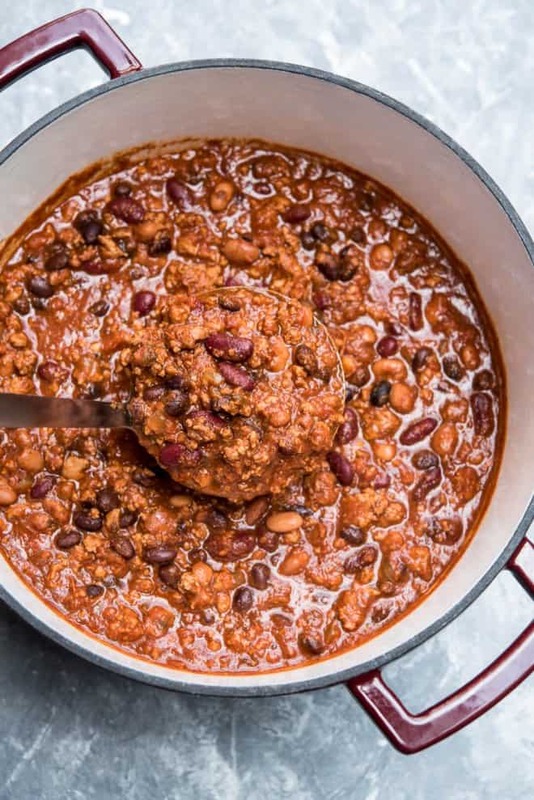 Crock-Pot method: After adding all ingredients to Dutch oven, transfer the mixture to a Crock-Pot, cover, and cook on low heat for 4 to 6 hours. 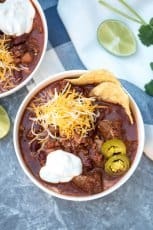 This is a chili my husband would love!! All the ingredients for a happy husband. Nicely done! I just love that webisode! It was very funny with the pig and the graphics! They really do a great job at AR with these videos! Thanks for sharing that here and on Pinterest! Thanks Lillian! It was a blast and David did such a great job with the editing. Made using crockpots. Great recipe thick and hearty. 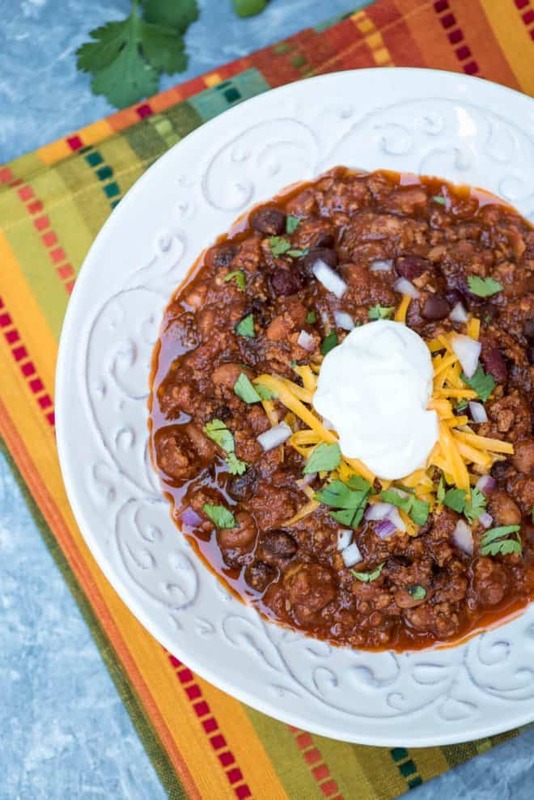 Great turkey chili love it!! Can I use beef broth instead of red wine? Or does the red wine really add to the taste? Thanks! I do think the red wine enhances the flavor but it will be delicious with broth as well. 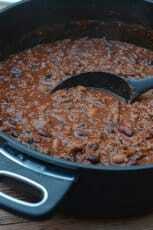 I’ve never really made chili like this usually just get a mix and add meat. This recipe was simple and easy and to try. It will be my go to recipe from now on. This is so easy and so delicious. Everyone in family liked it which is no small fete. I felt it was a little thick so I also added about a half cup of chicken broth. Makes the house smell fantastic too.